Cardiovascular diseases, which are the leading cause of mortality in the Western World, are closely associated with atherosclerosis development. Atherosclerosis is a chronic multifactorial disease of the arterial wall characterized by endothelial dysfunction, inflammation and oxidative stress. Oxidative stress is an alteration of the balance between pro-oxidant and antioxidant mechanisms which promotes vascular complications and represents a valid therapeutic target to prevent or treat cardiovascular diseases. Statins are enzyme 3-hydroxy-3-methylglutaryl-coenzyme A reductase inhibitors that have been included in the therapeutic regimen of cardiovascular diseases due to their lipid-lowering activity. Experimental and clinical data demonstrated that the antiatherogenic effects of these drugs are also related to other pleiotropic activities, particularly to their anti-inflammatory, anti-thrombotic and antioxidant effects. 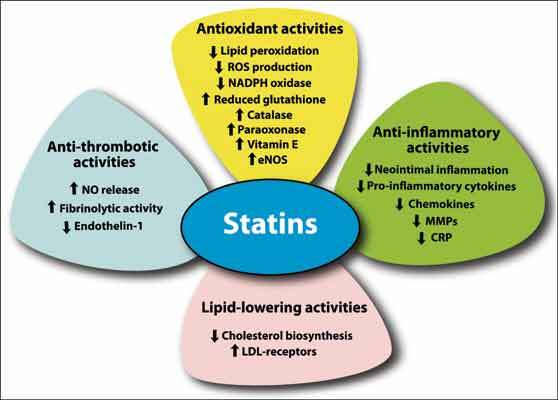 This review summarizes experimental and clinical studies demonstrating the impact of statins on atherosclerotic disease with a focus on the antioxidant activity of atorvastatin. Atorvastatin is a synthetic statin characterized by a high efficacy, in part due to its longer half-life compared to other molecules of the same group. It also exerts high antioxidant effects, independent from its hypolipidemic activity, beneficial for the prevention and therapy of atherosclerosis. Atherosclerosis, Atorvastatin, Endothelial dysfunction, Inflammation, Oxidative stress, Reactive oxygen species. Department of Infectious, Parasitic and Immune-Mediated Diseases, Istituto Superiore di Sanità, viale Regina Elena 299, 00161, Rome, Italy.